Simply the fastest way to launch your brand-new travel website! 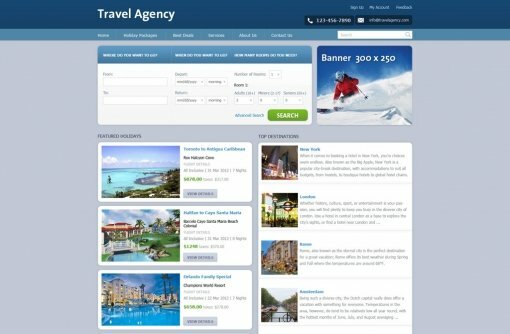 An attractive and fully manageable travel agency website! No need to spend a fortune on website design and programmers anymore! Our turnkey website is the fastest way to launch your brand-new travel website! 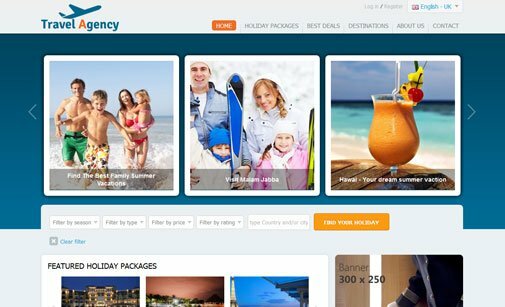 The ready-made travel website has a responsive design, built-in CMS and travel deals script. Get our Travel Agency Website and run travel deals website in minutes! Manage tour packages, prices and inquires hassle-free - save precious time and extra efforts! Below are the key features of the travel website. Need a modification? Contact us and request a quote! 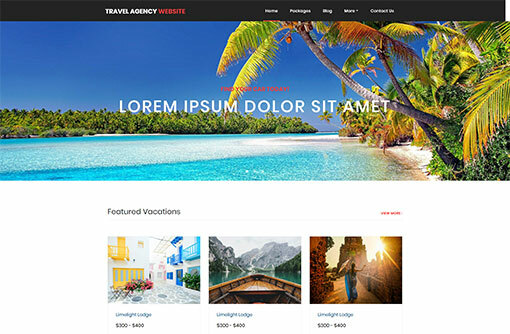 Turnkey website for travel agency with a nice, clean and responsive design, integrated classifieds module and user-friendly navigation, designed specifically to increase conversion and usability. 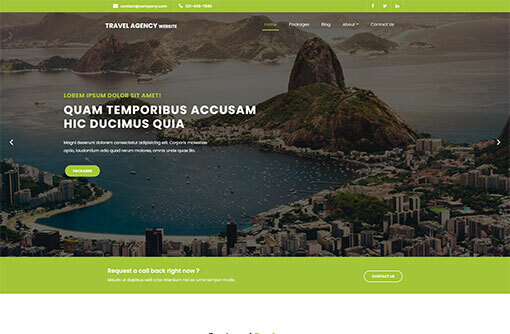 This ready-made travel agency website is built with responsive design to provide an optimal user experience on mobile phones, tablets and desktops. Ready-to-use within hours! The latest version of TinyMCE provides you with the best possible solution for editing web content and adding multimedia. 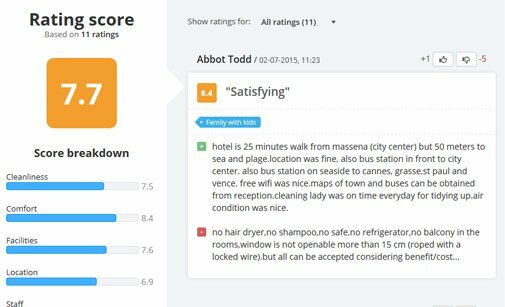 Managing your travel website is as simple as editing a document in MS WORD. It's important for a website in the travel industry to be accessible in multiple languages. 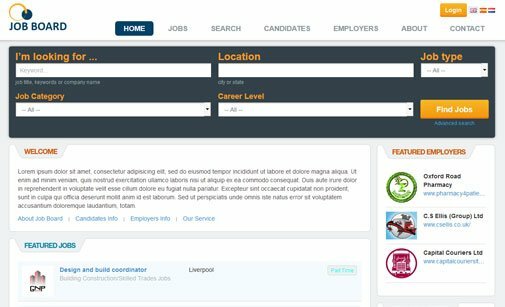 You can add any language on the travel website front-end and translate all the content in that language. Hotel owners or other travel agents can create accounts and publish holiday packages on their own. 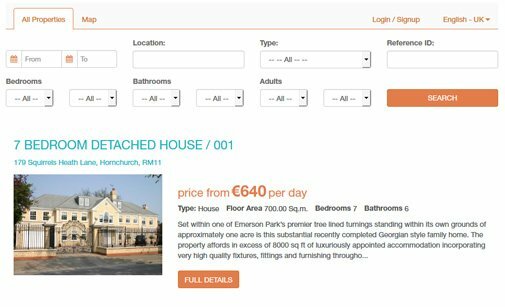 As an administrator you can allow 3rd party submissions, define prices for publishing, approve and manage 3rd party listings. 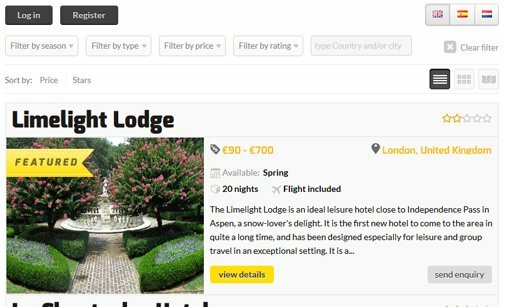 To increase conversion and usability we added widgets that certainly a travel website cannot go without – an Inquiry Module, multi criteria Filters, Review and Ratings, Google Maps, Social Media buttons, Newsletter Subscription, etc. 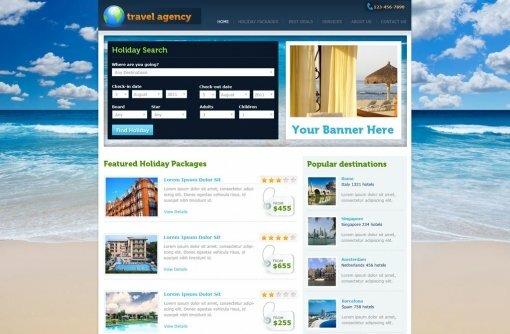 Below is a preview of Travel Agency Website. You can see both the front and the back-end and test all features. 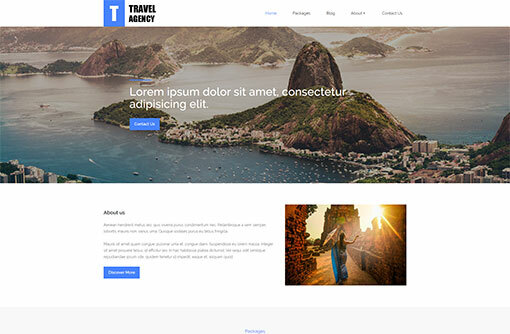 Preview front-end website for our ready-made travel website. 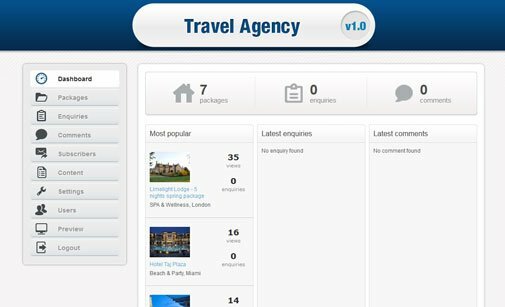 Click the button below to open the admin panel of Travel Agency Website. Review and request other online payment processing options! Send us your requirements and we will customize our scripts! Enhance your website with one of our custom designs. Order one of the available designs and we'll deliver your website with it. Click on any of the images below to review custom design image templates. Let our clients share their experience working with us and how our products improved their online business. When I learned that I'd have to send some money into the ether to a group of code and Bulgarian script writers completely unknown to me, well I was a little apprehensive. But my friend John testified that they were a great bunch to work with. Well, I can now give witness too. Brilliant bunch of guys, very responsive, attentive, keen to please. I am thrilled with the results and won't hesitate to use them many times over. I'm not, nor never will be a hard coder. Nice to know that PHPJabbers and their support team has me covered. What a great service. I'm telling everyone about how good you guys are. I will always look to your site for scripts before anywhere else. I love the software and the way it works, it is easy to set up and use. I will certainly be using you again in the future and as an affiliate marketer I will also be taking a serious look at promoting your PHP scripts when I complete this project. I stumbled across PHPJabbers maybe a year or so ago while looking for a specific script. It was exactly what I was looking for and I was immediately hooked. Their design skills, non-bloated scripts, easy for anyone to use, whether you're the web designer working with their scripts or the client that uses it later. To top this off their team of PHP developers are always there to support you. I recently used the real estate PHP script and had a major list of unique additions to add to it, I thought for sure it would scare them off. But nope! They added every function I asked for and now my client is ecstatic. Thank you so much PHPJabbers for your devotion in providing excellent scripts and amazing support, its a very rare thing these days. Your are web designers dream come true! PHPJabbers software and services are first class and I appreciate your quick response and attention to detail. It would be great if all companies had the same work ethics as you do! Review other scripts with similar functionalities and tune up your website! 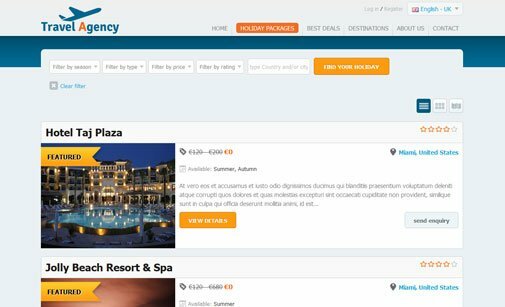 PHP travel script for publishing and managing holiday packages and travel deals. 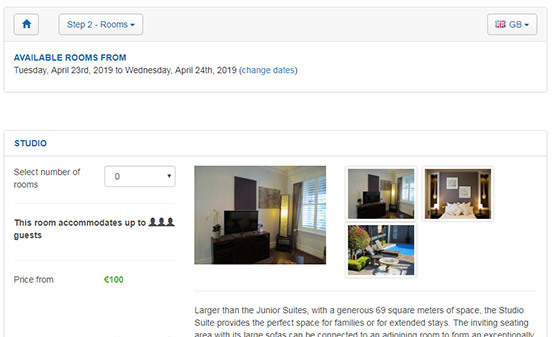 Web based vacation rental software for managing property rental classifieds online.